Welcome to the fifth annual Witch Week, an opportunity to celebrate our favorite fantasy books and authors. The inestimable Lory of Emerald City Book Review initiated this in 2014, inspired by Diana Wynne Jones’ book called, naturally, Witch Week. This is a fantasy set between Halloween and November 5th, Bonfire Night, marking the day in 1604 when Guy Fawkes was caught preparing to blow up Parliament. Chris at Calmgrove and I have volunteered to co-host the event this year, and therefore posts will be appearing on both our sites; you may comment on either or both blogs. This year we’re focusing on Feminism+Fantasy, in honor of the late Ursula K Le Guin, and we hope you might feel inspired to join in by linking up your own posts about books related to this theme. The goddesses of publishing have joined the celebration, for The Books of Earthsea: The Complete Illustrated Edition (Saga Press, 2018; illus. Charles Vess) goes on sale TODAY (in the US). I need to replace my well-worn 1980s Earthsea paperbacks, so I’m rewarding myself with a visit to the nearest bookstore to grab a copy before they disappear. 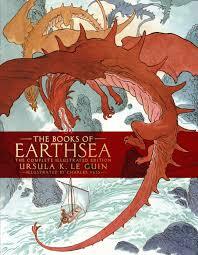 You may also wish to join in the readalong of Le Guin’s final Earthsea novel The Other Wind; or comment on posts in response to points raised; or simply enjoy the reviews and posts. Do please add your comments below and any links to your reviews on this theme — we’d very much like to see what you’ve all been reading — and feel free to respond to guest posts. However you participate, we hope you enjoy the week as much as we have putting it together! This entry was posted in Witch Week and tagged Diana Wynne Jones, Ursula K Le Guin. Bookmark the permalink. I hope you can go, but if it’s anything like getting me to Brooklyn (and that’s just 14 miles away), I can understand why you might hesitate. If you go, I’ll hope for a report on your blog. It looks like a great program, well aligned to what we’ve organized for Witch Week. We’re happy to be doing this, BJ, and also quite pleased that you’ve joined us. If you do read Kenning Magic, I hope you’ll let me know what you think.